You'll notice that in addition to the list of hard drives on the right, and the devices with removable storage, I've added some folders which are showing in the Network Location section. In addition to the libraries I explained in this article, you can place shortcuts here for quick access to places you visit often. 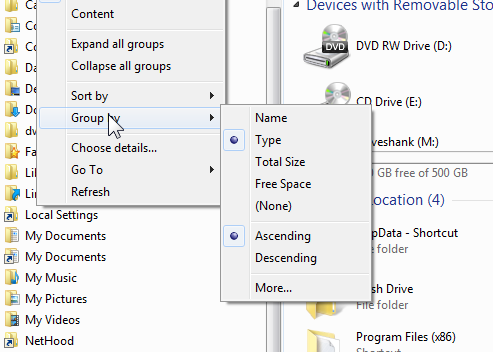 I use this for areas on my hard drive I go frequently but don't fit into a library. I suppose I could make a library called "Miscellaneous", but I used this technique instead. 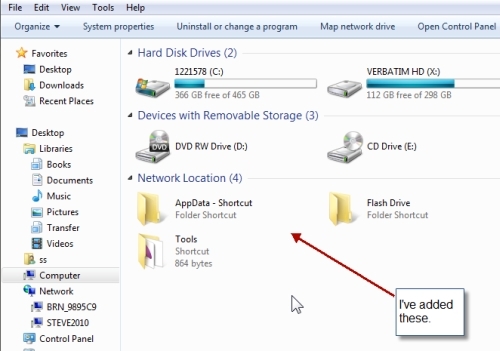 You need to make sure hidden files and folders are viewable, but if I setup your computer it already is. 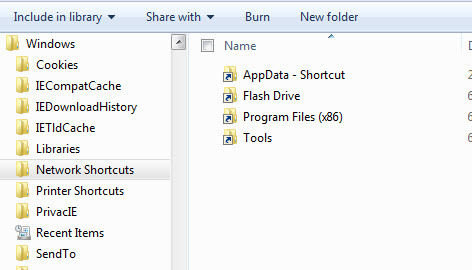 Now, any shortcut you put in that folder will appear in the network location area of your Windows Explorer display. So, simply find any place you visit frequently and would like to access quickly and right click and choose copy. Then return here and right click and choose Paste Shortcut. That's it.